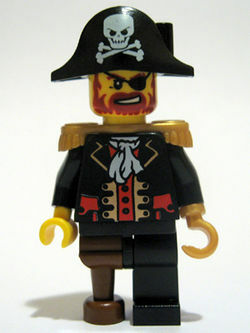 Captain Brickbeard is a minifigure. He is considered the replacement of Captain Redbeard in the Pirates theme. Captain Brickbeard is leader of the group of Pirates in the Pirates heme, and owns their main ship, the Brickbeard's Bounty. He has made an appearance in five sets so far. He's also been available in the Pirates Magnet Set, the Pirates Tic Tac Toe set and the Pirates Battle Pack. He has also been released as a keychain. Brickbeard loves gold. Not spending it, but by forging it into ornaments. This is both reflected by his appearance and his ship. He wears golden shoulder epaulets and a golden hook. His torso appears to have a lot of golden ruches and streaks. His ship is loaded with gold, as it is richly ornamented with golden plates, doorknobs, reels, flags and windows. The captain's quarters are especially well ornamented. Brickbeard has at least one hideout. He appears to flee less frequently from the imperial soldiers than Captain Redbeard. Brickbeard has been captured and taken to the Imperial Flagship and was seen trying to escape the prison there. The fate of his crew and ship is unknown. Strangely, Spinoza the monkey somehow made his way to Brickbeard. Brickbeard makes a cameo appearance in the closing credits of 2854298 LEGO: The Adventures of Clutch Powers along with Spinoza and the other pirates. In 4850307 LEGO Battles, Brickbeard had a parrot with him in each level similar to Redbeard's parrot Popsy. In set 10210 Imperial Flagship his hat does not come with the printed skull. Brickbeard is an obvious reference of the famous 16-century pirate Blackbeard also known as Edward Teach. This page was last edited on 15 March 2016, at 18:54.